Living Shorelines: Working with Nature to Protect Coastal Communities and Habitats. King Tides: Envisioning Sea-Level Rise: The Climate Network helped coordinate a regional initiative to engage citizens in photographing extreme high tides, helping document how sea-level rise may affect infrastructure and ecosystems. 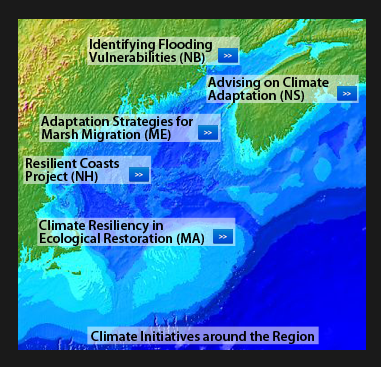 Learn more about this initiative at http://gulfofmaine.kingtides.net. 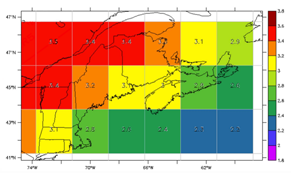 Regional Climate Dashboard: The Climate Network helped create a dashboard of recent and real-time data, giving site visitors ready access to a wide range of temperature, precipitation and oceanic data sets. Municipal Climate Adaptation: The Climate Network surveyed more than 30 municipal leaders around the Bay of Fundy to learn more about climate adaptation measures underway, actions planned and resources needed.